It was a busy day at Camp Jeanne d’Arc! We began it with chocolate chip pancakes for breakfast – those are a camp favorite! Then we cleaned cabins and went to 3 activities, some of those included the tournaments for Les/Jolis points. Tanhe girls compete in BBs, riflery, tennis, archery, and tetherball. Other activities were waterski, horseback riding, kickball, soccer, swim, and canoe. We had so much fun! Then at lunch we had grilled cheese AND mac & cheese. We had a lovely visitor from Catholic Charities join us for the meal and to collect the blankets we have made every Sunday this summer. (17 in all!). 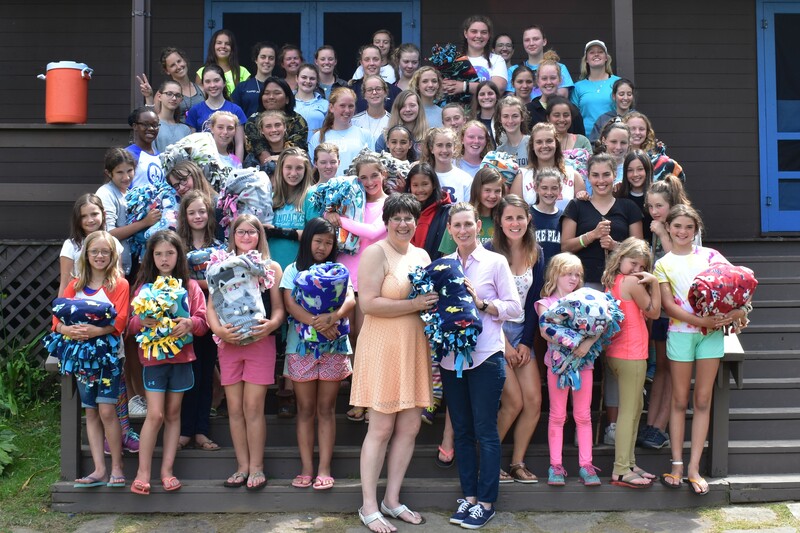 She gave us all an inspiring talk and let us know how grateful they are for the blankets made by the girls. After lunch we had extended rest hour and then wrote cabin songs! Each cabin made a song about themselves and their summer to share with the whole camp. We also had girls who were going out for clubs taking tests and showing off all the skills they’ve learned. Dinner was baked potato bar! Afterwards we had our Tacky Tuesday Talent Show. Everyone in camp took part as we performed our cabin songs, in addition to a few other performances. Everyone was so creative! Before bed we had campfire with s’mores – the perfect end to a great day!